07:35 PM - MansGame mentioned allstars in post Albert Belle - Show me what you have! 04:27 PM - gt2590 mentioned allstars in post RICH ROSEN - Levittown, PA - PM me I lost your email. 09:14 AM - George_Calfas mentioned allstars in post PLEASE fix your Photobucket Settings!!! 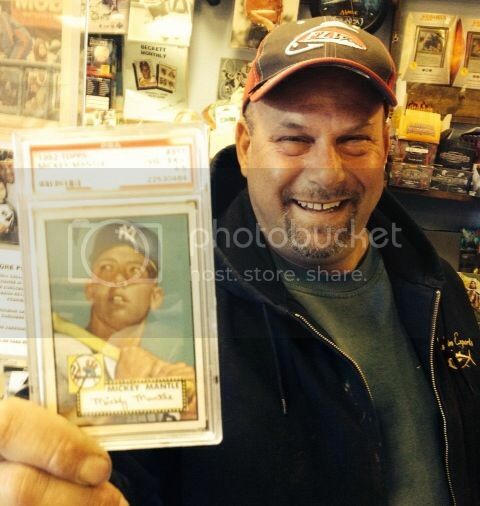 05:33 PM - MansGame mentioned allstars in post Why are baseball cards 2.5 inches by 3.5 inches? Thoughts? 11:12 PM - MansGame mentioned allstars in post HUGE thanks to allstars and George_Calfas - Mail Day! 07:20 PM - Captain Feathersword mentioned allstars in post One pack Panini Cerified and One pack Fleer Retro ... YAHTZEE!!!! 10:20 PM - gt2590 mentioned allstars in post Cash reward justin upton! 10:20 PM - MansGame mentioned allstars in post HUGE thanks to allstars! 03:29 PM - mrdallas quoted allstars in post Selling my 2014 Crown Royale collection. 02:46 PM - hive17 quoted allstars in post KRIS BRYANT ROOKIE CARDS...WHERE TO FIND THEM! 01:08 PM - DaClyde quoted allstars in post Would you buy a 2015 version of those small 80s store sets? 01:37 PM - JoshHamilton quoted allstars in post Supercollecting every base card for a current player; would you want all BGS 9.5 or PSA 10 ? 04:18 PM - allstars quoted rsmath in post It's a joke, right? 05:49 PM - allstars quoted gt2590 in post Health of our Hobby - Retail Shelf Space Decreasing? 01:04 AM - Gwynn545 quoted allstars in post Health of our Hobby - Retail Shelf Space Decreasing? 10:49 PM - gt2590 quoted allstars in post Health of our Hobby - Retail Shelf Space Decreasing?